Hornets pick up XC wins over Sayre, Sullivan County. Hornet XC teams end year at District Meet. Girls XC beats Jersey Shore, boys fall. Boys 3rd, girls 4th at NTL Coaches Meet. Boys XC beats Canton and CV; falls to Troy. XC teams fall to NEB, beat Towanda. Girls 11th, boys 14th at NEPA Invite. XC teams sweep Mansfield, Wyalusing. Cross Country teams compete in Altoona Invite. Wellsboro XC teams have strong showing at Lasagna Invite. NEB boys win sixth straight NTL Invite title. NEB boys win sixth straight NTL title. NEB hits record low score in NTL Championships win. Notre Dame boys, girls earn IAC cross-country sweeps. Wellsboro boys, girls top Coudersport. Wellsboro girls' cross country tops Jersey Shore. NEB boys, girls claim NTL crowns. 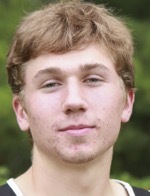 NEB boys, girls remain unbeaten in NTL cross-country. Canton girls 6th at NEPA Invite. Beard leads Troy past Athens. Local teams run at McDaniel-Baxter Invitational.